"Oh, I finished researching my family history." We'll stare at them, confused. Finished? It's very confusing from a mathematical perspective. Two parents, four grandparents, eight great grandparents. It keeps building. 4096 10th great grandparents. I know a handful of my 10th great grandparents, but not even double digits. Sure, there is undoubtedly some pedigree collapse, but I still have to identify the ancestors each time, so there are 4096 slots to be filled in that generation regardless of how many names get repeated. And even if at some point I have all 4096 identified, there are 8192 11th great grandparents. And then 16,384 12th great grandparents. How can anyone finish? And here I am only addressing one's ancestors. Family trees don't only go backwards in time. There's also the research of siblings, and descendants. 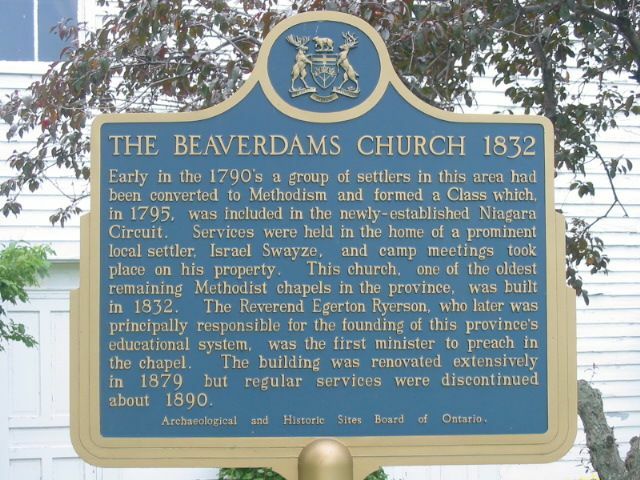 Early in the 1790s a group of settlers in this area had been converted to Methodism and formed a Class which in 1795 was included in the newly-established Niagara Circuit. Services were held in the home of a prominent local settler, Israel Swayze, and camp meetings took place on his property. This church, one of the oldest remaining Methodist chapels in the province, was built in 1832. The Reverend Egerton Ryerson, who later was principally responsible for the founding of this province’s educational system, was the first minister to preach in the chapel. The building was renovated extensively in 1879, but regular services were discontinued about 1890. Architectural and Historic Sites Board of Ontario. 1. Other sources indicate the meetings were on the property of Israel and his son, Hiram Swayze. Hiram deeded the land to the congregation where the church was built in 1832. 2. Israel Swayze isn't the only ancestor of mine responsible for the founding of a place of worship. My 8th great grandfather, Myndert Frederickse, helped found a Lutheran church in Albany, New York. And my 2nd great grandfather, Selig Feinstein, helped found Tpheris Israel Congregation in St. Louis. One of the two individuals mentioned in the clipping below from the Cincinnati Daily Press, July 26, 1860, might be related to my wife. However, that is not why I am sharing this. I found the phrasing particularly interesting. I am fairly certain if the below appeared in a newspaper today, many readers would assume something very different from what most 1860 readers assumed. "...Night before last, however, a wedding took place near the Brighton House and almost before the pair had become legally one, Charles Schrock and Henry Erndt became involved in a difficulty, when, after many words and a few blows, the latter drew a knife and stabbed his antagonist in the side and arm..."
Of course, both readers are making an assumption. We need to be extra cautious about the assumptions we make. Below I transcribe the obituary for my wife's 3rd great grandfather, Anton Schrock, which appeared in the Marble Hill Press on June 21, 1900. The clipping was found at ChroniclingAmerica. Died – At his home near this place, the 15th, Anton Schrock aged about 81 years. Deceased had been in poor health sometime and being quite old, was an easy victim. He was a highly respected citizen and has been a resident of this county about forty years and of the United States sixty years. He was born in Frankenstine, Germany December 31, 1819. He leaves a widow, seven children and a host of friends to mourn their loss. 1. The one word which, for almost any reader, will jump up and wave its arms about forcing the individual to take notice, is the name of the village in Germany. Not everyone realizes it is a name of an actual village. There is a castle there, too. 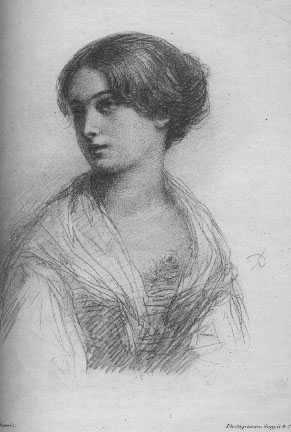 Mary Wollstonecraft, along with three author friends, including future husband Percy Bysshe Shelley, traveled nearby in 1814. They challenged each other to a competition to see who could write the best horror story. I don't think there is any dispute who won. Frankenstein was published in 1818. It should be noted that the only documentation I've seen indicating the village of Frankenstein as Schrock's birthplace is this obituary. Anton Schrock was born after the publication of the novel, and it's very easy to imagine that his claim to have been born there is about as truthful as my Polish-born great grandfather's claim to have been born in Dublin, Ireland. The passenger manifest for Anton Schrock and his wife, Caroline, indicate their town of origin was Neurode, Germany. Which is approximately 750km from Frankenstein. It's certainly possible Schrock was born in Frankenstein, moved to Neurode, and then immigrated to America. Caroline could have been from Neurode, and Anton from Frankenstein. There are a lot of possibilities. In Challenges of Adding Sources to Family Trees Part I James Tanner at Genealogy's Star discusses the historical reality that source citations are a relatively new focus. Six years ago, Tamura Jones at Modern Software Experience discussed Adoption and Genealogy in the posts Adapted Ahnenlist and Adoption in Genealogy. At that time, I had no idea adoption was in my future. If you're already familiar with the traditional Ahnenlist/Ahnentafel format, his idea for adapting it to include both (A)dopted and (B)irth parents is so natural, you probably don't need me to explain it here, or follow the links in the paragraph above. An instance where the letters in a numbering system are actually meaningful in themselves is rare, it seems like kismet when it happens. Of course, adoption isn't the only non-traditional relationship that the genealogist has to think about today. For example, it's 'conceivable' someone might want to indicate surrogacy in a chart. Polyfamilies may also wish to chart multiple lineages. 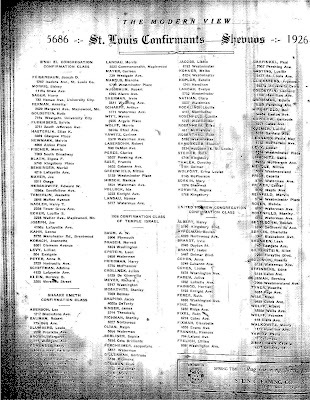 The individual genealogist might need to come up with their own lettering system, but no one should feel compelled to ignore a lineage in their reports important to them in their research. While it is possible to separate the lineages into separate reports, and this may seem easier, sometimes the whole can be greater than the parts. An interwoven ahnentafel might reveal commonalities and differences previously unconsidered. There are 26 letters of the Latin alphabet, and their meanings can be indicated in a key at the bottom of the list. If somehow we run out of room for relationships, there's always the Greek alphabet waiting in the sidelines. Diane L Richard at Upfront with NGSGenealogy discusses the importance of name pronunciation to genealogists. Cnaan Liphshiz at the Jewish Telegraphic Agency looks at the impact of geography on religious ritual in Fasting in the Lands of the Midnight Sun. As family historians we might consider the impact geography may have had on the customs of our ancestors as they migrated. The Lincoln Trio, a Chamber Ensemble, has released an album celebrating their ancestors with English, Armenian and Swiss composers. Have you researched the music of your ancestral homelands? I suspect a number of readers who have had their DNA tested will look at my wife's numbers, and feel they are similar to their own. And then look at mine and be surprised. "You're so lucky!" they'll think. Except...I'm sure there's a large number of false positive matches. Back in 2014 Ancestry changed their formula to reduce the number of false positives in general, but I think it's still high for Ashkenazic Jews. It's definitely still high for me. I have 437 pages of matches, 50 matches each, or a total of 21,850 matches. This obviously includes a lot of ancestors Ancestry categorizes as "Distant" or 5th-8th cousins. The situation is similar at FamilyTreeDNA. I have a total of 5,728 matches, my wife has 876, and my mother has 3,374. So if I assume the number of matches everyone gets, in a purely random environment, should be approximately similar...It's possible between 4/5 and 5/6 of my "4th Cousins or closer" matches are wrong. Another situation I have -- several years ago, I came into contact with another researcher on one of my paternal lines who had done a lot of research in Polish archives, and his research took back that surname for me a couple generations providing many cousins. Yay! However, the name he had for my second great grandmother was wrong, the date of birth for my second great grandfather didn't match family records, and the birth record for my great-grandmother hasn't been discovered yet, leading me to wonder if there wasn't a second person with my second great grandfather's name. Well, this person has been declared a cousin of mine by FamilyTreeDNA, and the distance corresponds to the research I was given. However, is this proof? James Tanner at Genealogy's Star has been discussing the future of genealogy in a series of posts on The Dawn of the Genealogical Information Age. Science Fiction author David Brin asks the question: How will augmented reality change us? Brin's focus is on whether AR spells doom or excitement. I have a preference for being optimistic. The two of them got me thinking, with the increasing amount of data available, and increasing technological advances, how will this impact the future of genealogy? In particular, augmented reality and virtual reality. Instead of just QR barcodes popping up additional information on your phones, might future trips to cemeteries involve images of the deceased telling visitors about their lives. Augmented or Virtual librarians? I doubt a computer program can provide the personalized help a living librarian can, but when all the staff are helping other patrons, an AR/VR librarian might be available to provide some assistance. Will there come a day when the average person can do their own programming as easily as we can create webpages today, and generate simulations of their ancestors? Imagine the possibilities for family reunions. Can you imagine a virtual cemetery version of FindAGrave? Will people be able to visualize walking through the actual cemetery? When they find their ancestor’s plot, perhaps they will be able to lay a virtual flower, or place a virtual stone, on the grave. Perhaps the program will have a link to relative graves – at other cemeteries to ‘walk.’ It won’t matter if the writing on the actual tombstone has long since been worn away if the image of it is in the database. Will you be able to provide a computer program with a photo of your ancestor and military records, and they’ll insert the face of your ancestor into a battle they actually fought in. Many family historians would like to be able to visualize how their ancestors lived, and we might be close to being able to provide that experience. Lots of genealogists are worried about the disappearance of microfilm, saying if you don’t know exactly where it is with indices, it’s much easier to find a record in microfilm than it is online. What about a virtual microfilm reader? If microfilm readers really do provide an easier browsing mechanism, why not recreate that mechanism virtually. Below I transcribe a list of Confirmation classes from St. Louis area synagogues in 1926, found in the May 14, 1926 issue of The Modern View. 1262 Isadora Ave., St. Louis Co.
733 Heman Ave., University City. 2620 Margaret Ave., Maplewood, Mo. 3236 Walter Ave., Maplewood, Mo. 1. 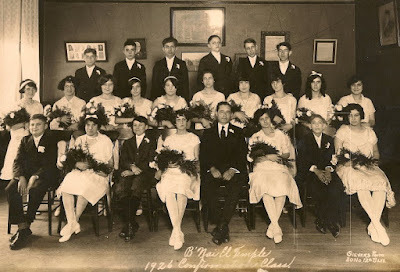 Here's a photograph of the B'nai El class, which I have shared previously. My grandfather has the thin white rectangle outline in the lower right. Somewhere else in the photograph is his first cousin, Sylvia Fudemberg. Melvin was 13 in the photograph. He would turn 14 in August of 1926. Sylvia had just turned 14 in April. 10th grade, when the youth are 15 or 16, is a more common age for confirmation ceremonies today. It's been a few years since I've done this. I'm still following genealogy news and advice on blogs, and other social media, so I'll try to share a weekly list. Philip Trauring at Blood and Frogs advises: Don't Get Stuck Inside the Box. The Ancestry Insider illustrates why detailed image citations matter. Michael Twitty of Afroculinaria challenges Bill O'Reilly to eat like a slave for a week. The Smithsonian Magazine discusses the newly released London Picture Map. "Think of the map as Google Street View for vintage London. You can click on the map to view historical images of particular buildings, streets or areas, or search the collection by topic to reveal everything from historic coffee houses to buildings associated with different authors or time periods." FamilyTreeDNA has a $30 off sale on several of their packages. $69 for the basic FamilyFinder package is probably the lowest you will see an autosomal test offered anywhere. Maureen Taylor at The Photo Detective provides some tips on how to tell if two photos are of the same man.